Sorry for the dull photo. It's dull and rainy here today...blech. 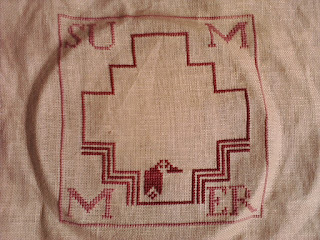 I also worked hard trying to finish my Quaker Summer design and the By the Bay freebie and almost got one of them done. I think Nina's Thread colour "Old Berry" is the prettiest colour I have used ever. The photo doesn't do this rich, luscious, make me think of a real berry colour justice at all. Too lazy to iron today....it's raining what can I say! Such a cute design isn't it?! I love that sailboat and red house! My hubby really likes it too. We both dream of having a boat together so we can float off to sea! Oh, and who here wants a Titus photo?!?!?! He's such a popular fella. 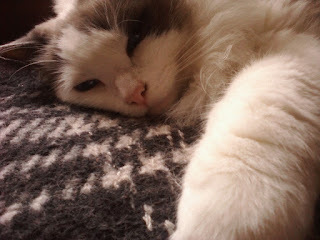 So glad I have him because I would be mighty lonely here while my darling is in Saskatchewan. I see loads of amazing posts on my sidebar that I can't wait to check out! I am a wee bit behind but should catch up this week...hopefully! That and I plan on doing some actual finishing...hopefully....just send that finishing fairy over to me k!!! Hugs to all from me and sweet "ladylike" Titus!!! You have so many great WIPs . I can't wait to see them all finished. What a lovely picture of Saskatchewan. Cute kitty too! Lots of pretty stitching! Love that By The Bay piece. Once again, we have the same taste. I did that one on a card some time ago. Beautiful photo of that sky! All of your hermit stitching is wonderful! I love that By the bay piece! 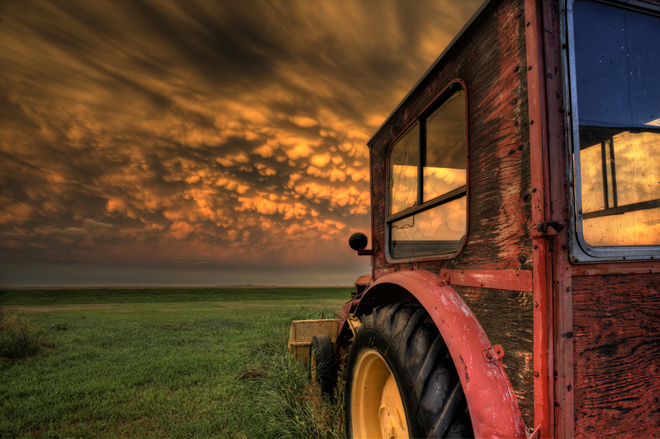 That pic you found of the sky in Saskatchewan is amazing! And Titus is adorable! 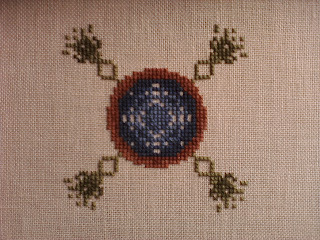 Beautiful stitching on all your WIPs! And Titus is such a cutie-pie! The color of "Old Berry" is beautiful. Scenery of wonderful Saskatchewan!! Great stitching on all pieces! Great progress! i love the little By The Bay piece. That is a beautiful, amazing photograph. Perhaps you will get lots of stitching done with the rain and Titus for company while your husband is gone. Really pretty work over the weekend! Great job. :D Hopefully your DH will be there and back before you know it! Found your blog through Random Ramblings blog. Your projects are lovely and your kitty is adorable! You did really well this weekend and your projects are lovely. I like the variety. Nice pieces you have on the go. The By the Bay one will be nice and colourful if going by her last freebie. Oh, man, that Titus is stealing your blog! lol. He's so cute and very photogenic I must say! You did great or just one day of stitching! You got lots done during your IHSW, Anne. Great job!!! I love the lighthouse in the background most, lol. (It's the one design element you didn't mention!!!) Good job on pulling Joyce into stitching with us this weekend. It's been a while since she got some good stitchy time. 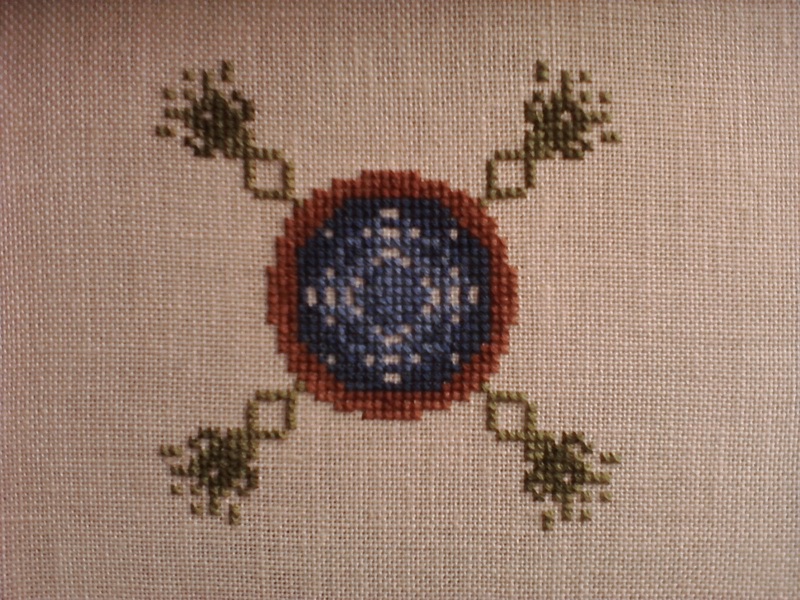 Gorgeous stitching on 'Knot Garden', and those rich colours are wonderful! So you are the one that tempted joyce out of cross stitch hiding... YEAH!!! Knotgarden looks great and Titus is as amusing as ever! Sorry for all the rain--things are dying and drying up over here. It feels more like September walking across all the crunchy brown leaves that have prematurely fallen! Yup, you did the impossible... although 'bullied away' might've bee more appropriate. HAHAHAHA!!!! That Sask pic is amazing!!! Man.... I'd sit there and just stare. Lots of nice stitching going on! Cute pic of Titus! What a character! LOL! Good job on getting Joyce off D3 :P You've made a good start on Knotgarden. Good progress on your WiPs too. Stunning photo of the sky! I wanna be there too. So have you managed to wear those pretty red shoes? Gorgeous stitching Anne. Love your Chatelaine start! 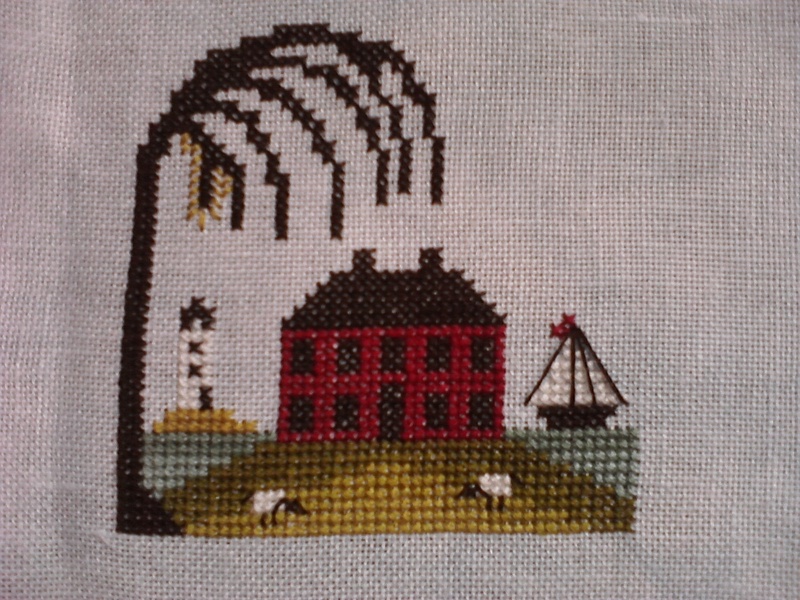 Nice stitching, Anne! Love that photo :) Glad you have Titus to keep you company. I haven't had much time for commenting lately but I must tell you how much I've enjoyed the Titus pics. He is one sweet boy!! Hahaha congrats on pulling Joyce away! I didn't think that was possible especially when Diablo III was involved. Gorgeous work on Knotgarden. I hope it doesn't give you any more trouble. What amazing progress you've made. Love seeing Chatelaine pix. Great stitches!!! Sweet Titus is such a cute companion! Nice stitching and congrats for having pulled Joyce off Diablo 3! Can't wait to see more of yours Chatelaines, and hopefully next years I'll start my first one!